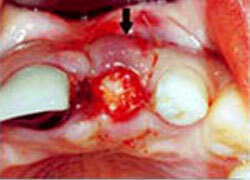 Regeneration of the tooth socket is critical for successful implants and cosmetics concern. Socket preservation is a term used when special techniques are used to encourage regeneration of the bone in an extracted tooth socket. The body spontaneously fills tooth sockets with bone, however the extent of the bone fill is dependent on the bone walls around the socket that remain after the infection and the tooth extraction. Therefore, we place a bone graft at the time of tooth extraction to best aid in your body’s attempt to fill in the socket with bone. This procedure will maintain the width or volume of bone you need for implant replacement. The common use of implants for tooth replacement has made regeneration of the tooth socket critical for successful implants and cosmetics concern.